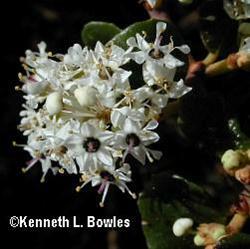 A small white flowering medium shrub that is native to Southern California chaparrral and is drought resistant. The leaves are olive green, crinkly with white fuzzy undersides and the flowers are white and come in clusters. It is best grown in hot interior gardns for erosion control or as a transition into chaparral or coastal scrub. Put it in full sun, with well-drained soil. it is slower growing than most of the more common garden ceanothus.